Rhodochrosite's red/ pink colour helps to blend courage, passion and will power, giving the fortitude to overcome emotional trauma and mental breakdown. It enhances memory and intellectual power, it is an emotional balancer which helps heal emotional wounds and traumas. It aligns subtle bodies. It represents Divine Love and encourages acceptance of self and life.It enhances loving relationships, offers tolerance, compassion and kindness and promotes friendship. Powerful healer, helps spleen, kidneys, heart, pituitary gland, and circulation of blood. Rhodochrosite is associated with both the planet Mercury and the planet Venus. 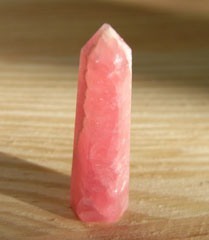 Rhodochrosite activates Muladhara - the Root Chakra ( 1 ) and Anahata, the Heart Chakra ( 4 ).